We recently announced the general availability of Azure IoT Edge, allowing you to deploy cloud workloads like AI and machine learning to run directly on your IoT devices. Now devices can act immediately on real-time data—whether it be recognizing a crack in a pipe from an aerial view or predicting equipment failure before it happens. We are taking the next step to ensure our customers’ IoT solutions operate reliably in remote locations and harsh conditions—where cloud connectivity is intermittent at best. Today, we are happy to announce extended offline operation for Azure IoT Edge, now in public preview. Existing capabilities have been enhanced with device restart and device-to-device communication even when disconnected from the cloud. 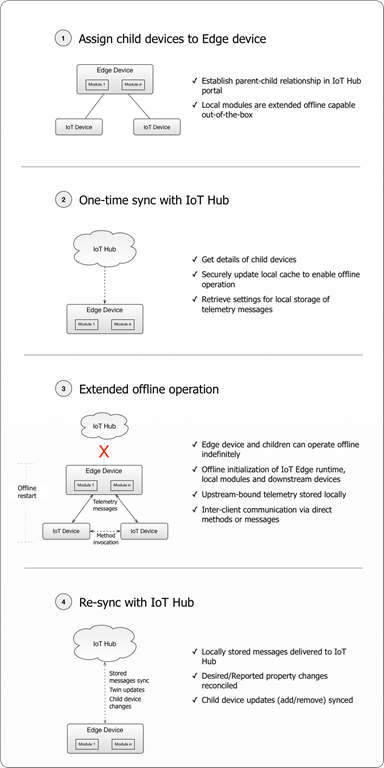 After a one-time sync between the edge device and Azure IoT Hub, the edge device can function in offline mode indefinitely. When using an edge device as a transparent gateway, we are releasing a new portal experience for assigning IoT devices as children of the gateway. Assigned children can connect and communicate with their parent or siblings even when there is no Azure IoT Hub connectivity. These new features deliver frequently requested functionality by customers as a number of real-world scenarios require the power of a remotely-managed intelligent edge in the absence of a steady cloud connection. It is easy to imagine how useful this is in use cases like detecting abnormal conditions deep in a remote mine, or a search-and-rescue drone scouring the open seas for survivors. The capabilities are summarized below in the diagram, read the documentation for details. We look forward to your feedback!